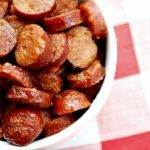 With just 5 ingredients this easy recipe for Crock-Pot Sweet Kielbasa takes less than 10 minutes to prepare & then you can just forget it while it cooks in the slow cooker for hours. A great appetizer recipe that your guests will love, serve these sausage slices at your next holiday or game day party! This is one of those recipes that takes literally less than 10 minutes to prepare. Just slice up some kielbasa sausage (I used pork but you could use all beef or turkey kielbasa too), mince some garlic and measure out the other three ingredients. Then, you just dump everything in the slow cooker, let it cook for about 6 hours on the LOW setting until everything is nice and hot and bubbly and then, flip your slow cooker to the WARM setting to keep it all warm while you serve these tasty sausages at your next party. I usually just set out a little container with toothpicks in it and let my guests help themselves. And the flavors are great. Applesauce and brown sugar add some sweetness and Dijon mustard and garlic balances out the sweetness with some tang an savory. And of course the sausages themselves lend some salt and meatiness. 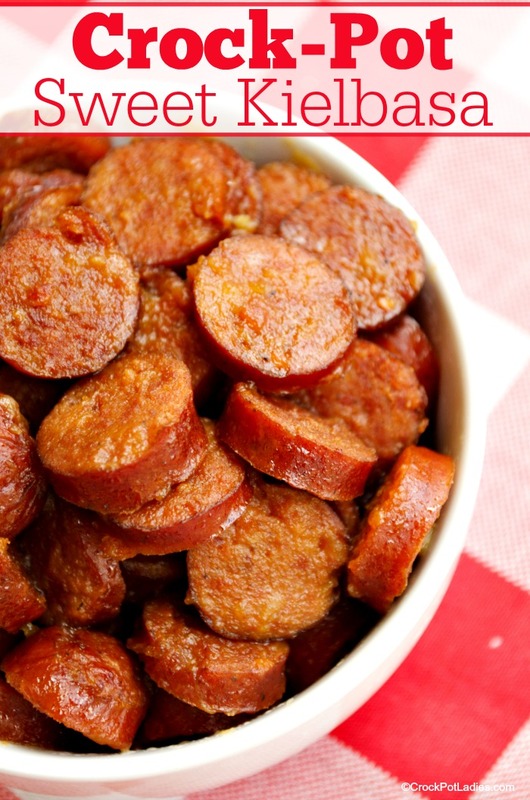 Just 5 ingredients in this super easy kielbasa recipe. Applesauce and brown sugar adds the sweetness while Dijon mustard and garlic add a touch of savory! 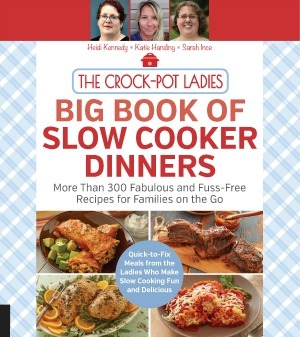 Add all ingredients to a 4 quart or larger slow cooker and stir to combine. Stir once more and turn slow cooker to the WARM setting to keep warm while serving. Sounds great! I will have to give it a try. Always run out of snacks ideas for kids. this is a good recipe willnsurely try. What kind of Kielbasa do you use? Fresh? Smoked? The Eckrich Brand from the grocery store? 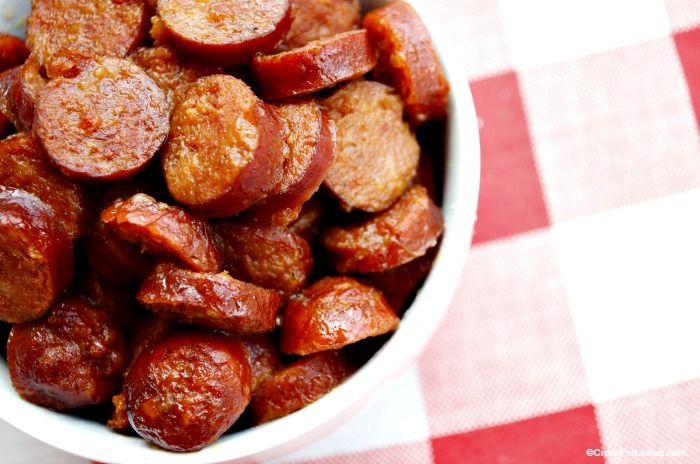 Smoked Kielbasa such as Eckrich or Hillshire Farm.